I think there is a time in every man’s time when he begins to enjoy horseradish (chreň). I remember, as kid, my revulsion to anything containing this vegetable. And now, I find horseradish mustard (chreňová horčica) to be my favorite kind. Horseradish is an ancient plant from the same family as broccoli, mustards, or cabbages. It is grown for its large root, which is grated and preserved in vinegar. It will keep refrigerated for many months. You will horseradish in your grocery store in the deli section, next to pickles and some exotic cheeses. Sauce (omáčka) made out of horseradish is very popular in Slovakia. In making it, I used mix of three different recipes. The amount of flour came from Recepty Starej Mamy by M. Murtišová. 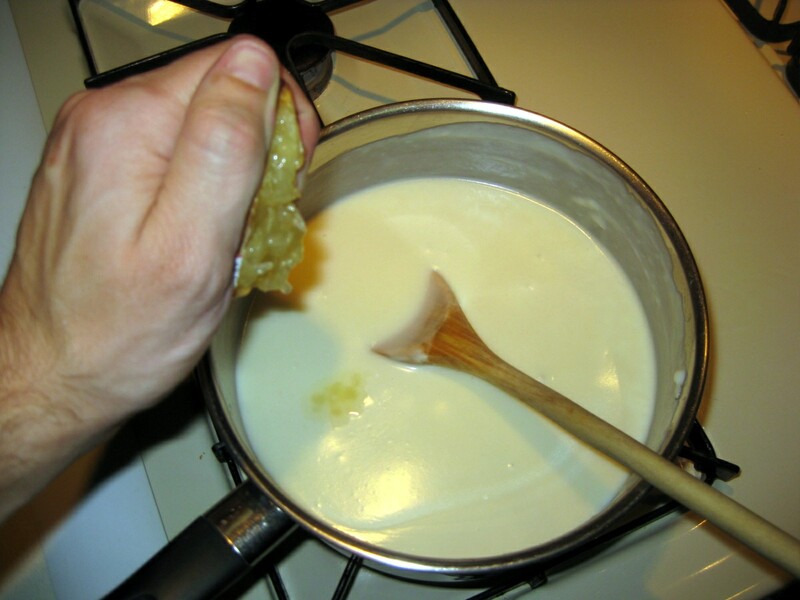 The cream and water came from Slovenská Kuchárka. And finally, the serving suggestion is from mimibazar.sk. Start by preparing zápražka (roux) by browning the flour on oil (or butter). Add milk and cream. Then add salt and one tablespoon worth of lemon juice (citrón). 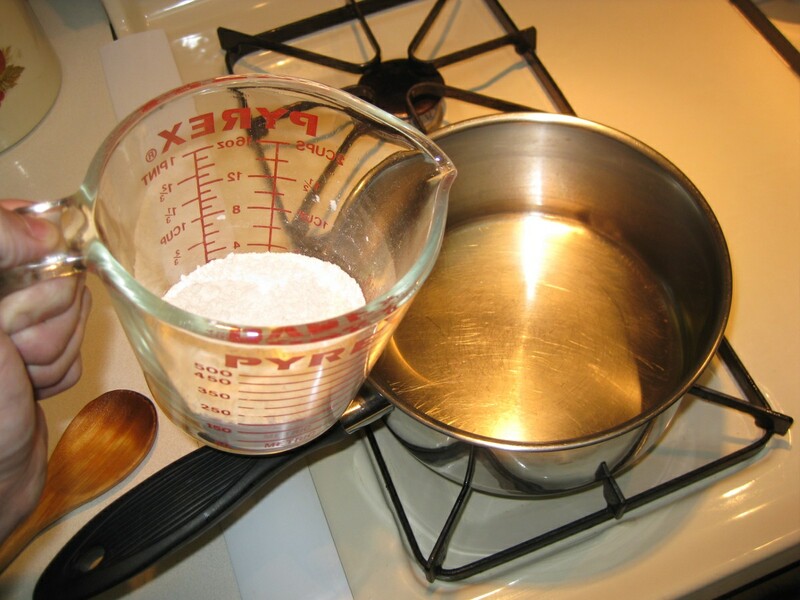 Add water as needed – I needed about two cups. Continue stirring and let go through boil. 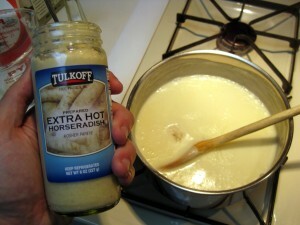 Then turn the heat off and add 100g – half this jar – of horseradish (chreň). 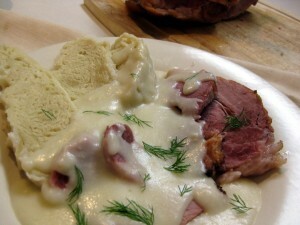 Serve with smoked meat (údené mäso) and knedľa (the popular Czech/Slovak steamed dumpling). 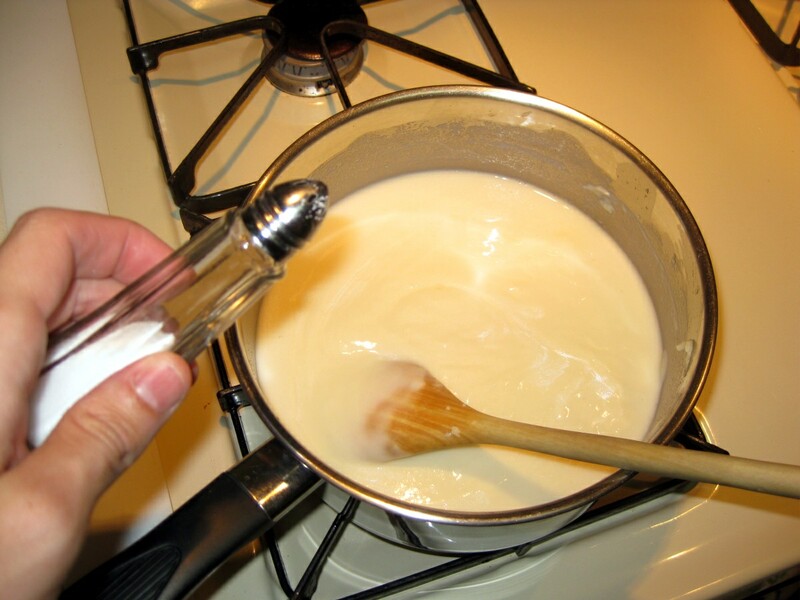 How do you make horseradish sauce? Please share your recipe and let others know. 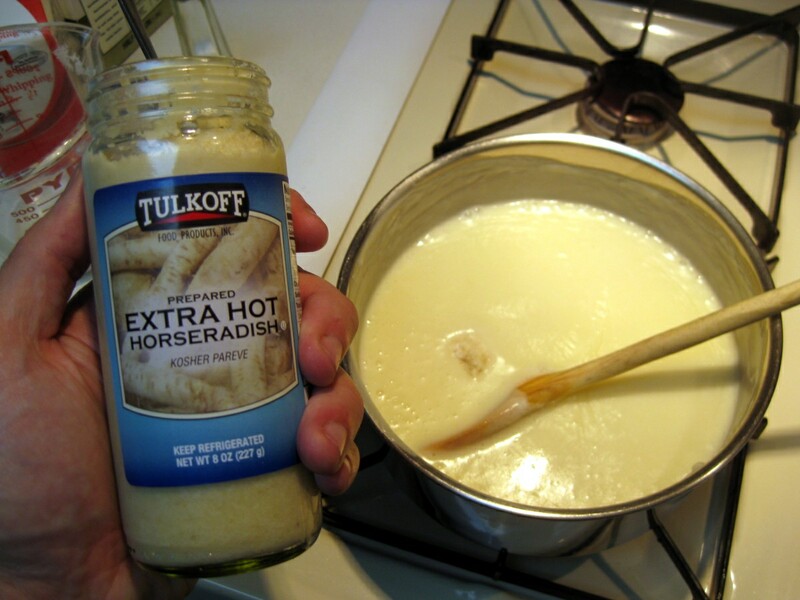 If you are short on time a quick shortcut to a good Horseradish sauce is this, get a can or two of Campbells Country style gravy and add 3-4 tablespoons of horseradish (to taste) to each, not as good as from scratch but fine!! Enjoy!! Thank you for the tip, Steve. Why do you say that radish is ‘chreň’, when the correct slovak name for it is ‘chren’? is it something from bystrica? Chreň is so much easier to say than chren. The latter is like those tongue-twisters. At the end of your recipe u add dill, didnt u?Kopor, hmmmm or it is something else? Ahoj Ivka, yup that’s dill (or kôpor in Slovak). When I visited a friend in Slovakia I had a Horseradish sauce. I hate horseradish but my friend told me that it was not like real horseradish so I ate it and found it very pleasant. Is this a very mild taste? Základom je bešamelová omáčka, pridám čerstvý nastrúhaný alebo sterilizovaný chren, soľ, kryštálový cukor, ocot. Chuť má byť mierne sladkokyslá. Bešamelová omáčka: na oleji si z hladkej múky urobím vačšiu zápražku, zalejem studeným mliekom a miešam do zhustnutia. Osolím. Takto pripravujem aj špenát. Bešamelovú omáčku urobím tak, že upražím cibuľu, pridám hladkú múku a zápražku zalejem studeným mliekom a miešam do zhustnutia. Pridám rozmrazený špenátový pretlak, jedno surové vajíčko, soľ. Ak je špenát veľmi hustý, pridám ešte mlieko. Dobrú chuť. It is based white sauce, add fresh grated horseradish, or sterilized, salt, granulated sugar, vinegar. Taste has to be slightly sweet and sour. 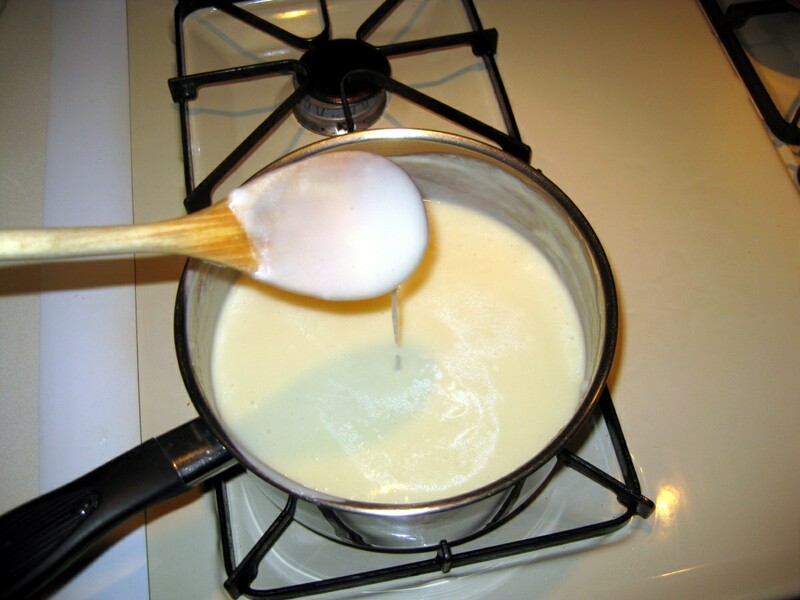 Béchamel sauce: the oil from the flour will make more roux, pour in cold milk and stir until thick. Salt. Thus, preparing the spinach. 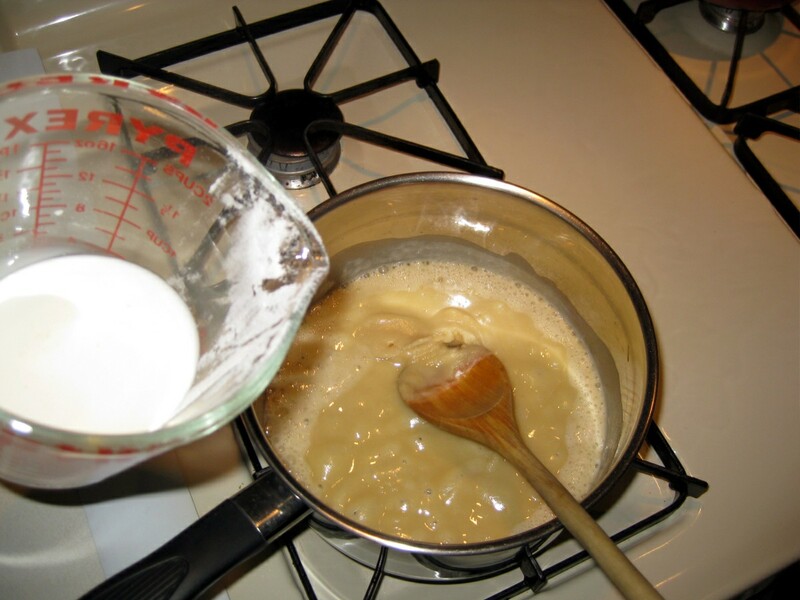 I make a bechamel sauce, so that fry onion, add flour roux and pour in cold milk and stir until thick. I add thawed spinach paste, a raw egg, salt. If spinach is very thick, I add more milk. Enjoy your meal. Meetings are indispensable when you shouldn’t a single thing. Lubos, what the heck is this? Mistake or spam?